Chia pudding. Over-night oats' competitor, with the advantage of the 'dessert' tag. It's really just chia seeds - high-protein, high-fibre, nutritious little powerhouses - soaked in water or milk with some fruit for flavouring. The trouble with both is that you need to plan ahead. There's no spontaneity involved. Of course, it does also mean that you get what you want without the nasties, as with all homemade dishes. Fortunately, some people have already considered all these details. 'Some people', in this case, referring to The Chia Co. 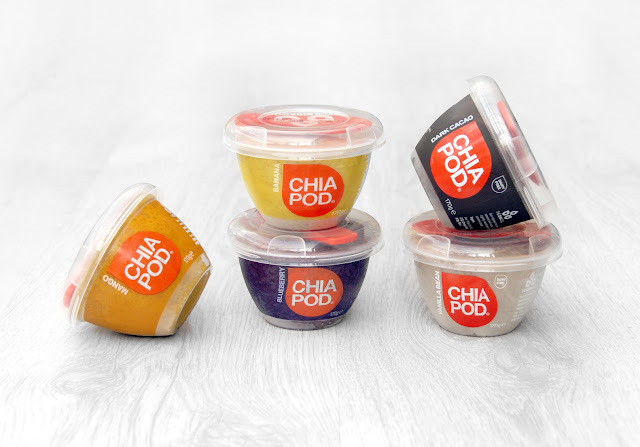 This Australian company have created Chia Pods, little cups of chia pudding with absolutely no nasties, so that we can have our pudding right when we want it. Welcome back, spontaneity. They come in a range of wonderful flavours, but the first of the few downsides are that the range in Australia differs to that in the UK. But, fortunately, that doesn't mean there's a smaller choice. The UK has some flavours the Aussies don't, and they have some we don't. For example, the Apple Spice in Australia really appeals to me, but I can't get it - whereas the Blueberry I can get provides the same issue for the Aussies. I don't understand the reason behind the differing stock, but I'm happy to take the trade-off. Every pot is mild in flavour; nothing is too sweet, but you don't need to concentrate to detect the flavour, and neither is there any strange after-taste. Every flavour is as you'd expect. Personally, I don't actually like bananas, but I've discovered that I quite like banana-flavoured foods. Trek's banana bread flapjack is one of my first choices in a mixed box. But I am still dubious about any new banana foods, which is why the banana Chia Pod was the first I'd tried of the selection. I wasn't disappointed. If you've never had chia pudding before, the texture is something to get used to. 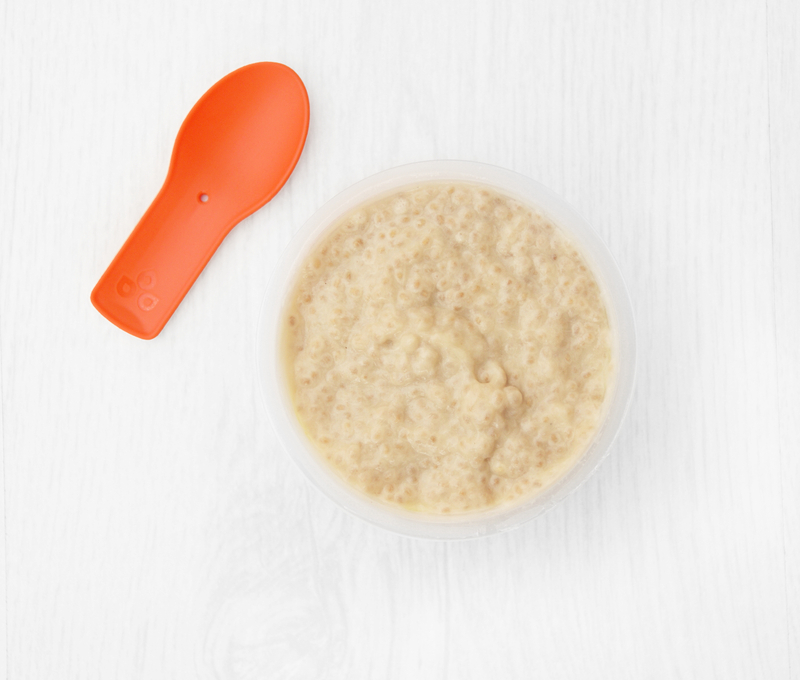 It's not like porridge, it's more like a lumpy gel, and very slurpable. Chia seeds form a 'gel' because chia seeds are more hydrophilic (attracted to water) than any other seed - the micro-fibre layer on the outside of the seed stands on end in water and allows it to hold nine times its weight in fluids. So 'chia gel' is not actually a 'gel' at all, it's just trapped water, and as it's removed very slowly in digestion, the water helps to smooth the digestive process. Chia seeds also have no flavour of their own, and with their absorption abilities, readily take on the flavour of whatever they're paired with. But why bother? Well, unlike all these oat pouches and 'just add water' instant breakfasts, Chia Pods involve very few ingredients, and nothing artificial. Just chia 'gel', fruit puree and coconut milk. They pack 4g of protein and a hefty 7g of fibre, vitamins and minerals, and only sit at 150 calories. This gives your day a wonderful nutrition and brain-power boost! Chia Pods are a great high-protein, high-fibre, simple and wholesome snack pot, and when teamed with a piece of fruit and the spoon that comes inside the lid of each pot, perfect for breakfast on the go. They're also amazing hot or cold - pop them in the microwave for 45 seconds and they're perfect for autumn mornings. Find them in the chilled section of Tesco, Holland & Barrett, Planet Organic and on Ocado.